Aqualine offer a range of sauna heater products. 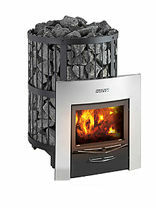 Our sauna stoves are ideal for bespoke sauna cabins or for converting a traditional sauna. Our sauna heaters are easy to install. A sauna heater performs a demanding task, and requires a rugged design and solid construction in order to be counted on to provide enduring, dependable service. 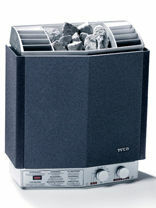 A good sauna heater needs to be able to efficiently and consistently heat a room up to 200 degrees Fahrenheit and more. Sauna heaters have several functions; to efficiently produce and disperse heat within a traditional sauna room, to retain heat through the use of sauna stones, and to produce steam when water is poured over the sauna stones. When selecting a reliable and effective sauna heater, there are a few design aspects that should be considered. Construction material is important as higher quality materials such as high-grade steel resist corrosion and dramatically improve the longevity of the sauna heater. Interior insulation and multiple-wall construction improve heating efficiency and keep the exterior surfaces cooler. And quality heating elements, the core of a sauna heater’s function, deliver quicker heating times and more reliable performance. There are two choices when selecting an appropriate control set-up for a sauna heater. The first is a mechanical timer and thermostat built into the base of the sauna heater at the factory, which can make installation of the unit quicker as there is less wiring involved with this configuration. The second is a wall-mounted control, available with either a mechanical timer and thermostat or a digital electronic control pad for the sauna heater functions. Digital control set-ups often include controls for other sauna functions as well, such as an interior light. As functionality remains essentially the same for both types of control, personal preferences and installation requirements should be paramount when choosing the right control set-up for a sauna heater. 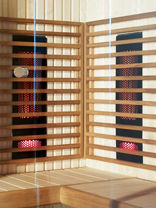 Aqualine Saunas also offer a fantastic range of Infrared Saunas and Traditional Finnish Saunas.